and conditioner—reducing the number of products and chemicals your little one is exposed to. The gentle foam cleans from top to bottom with no harsh ingredients or synthetic fragrances. It contains an exclusive blend of biodegradable and sustainable ingredients that leave skin and hair feeling silky soft and clean. And did we mention it makes tons of long-lasting bubbles? 236 ml / 8 fl. oz. Problem: Making sure your kids get completely clean at bath time can be challenging. You need a gentle, fun-to-use product that gets them clean head to toe, is easy on the environment, that they will love. Is that too much to ask? 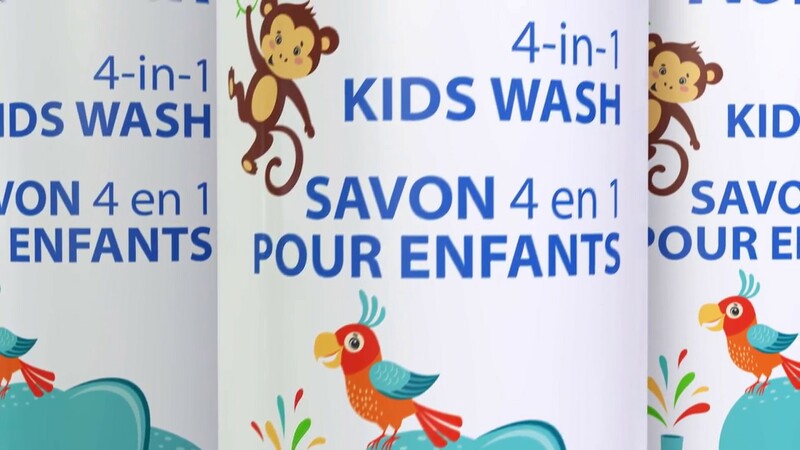 Solution: Why spend money on four products when all you need is our 4-in-1 Kids Wash? It’s an extra-foaming body wash, bubble bath, shampoo and conditioner all in one. With natural ingredients and no harmful chemicals, it’s safer for them and safer for the environment. Plus kids of all ages love the fun scent and longlasting bubbles. The only challenge now will be getting them out of the bathtub! • Pour one to two capfuls into running bath water to use as a bubble bath. • For use as a shampoo/conditioner, help your child wet their hair, then gently massage a pea-sized amount onto their scalp. Rinse well with clean water. • To use as a body wash, apply a small amount to wet skin and rinse. Can be used with the Baby Body Pack. • Mild, skin-friendly formula gently cleanses and nourishes children’s and babies’ delicate skin. • Multifunctional 4-in-1 body wash, bubble bath, shampoo and conditioner saves time and money. • Ultra-concentrated; a little goes a long way. • Long-lasting bubbles make bath time something they look forward to. • Gentle preservative is GMO- and gluten-free. • All ingredients were carefully selected for their natural source and biodegradability. The bubbles on top of the water actually insulate the bath water, keeping it warmer for a longer period of time.